I am probably the only person in Hong Kong that has noticed that our Government has criminalised the very act of living - everywhere you go here you see signs warning you of the severe penalties for littering, spitting, smoking, speeding, eating on the trains, having leaking airconditioners, not displaying ingredients on food packaging, taking more than 2 cans of baby formula into China and the list is endless. Not only that, if you watch TV or listen to the radio you are assailed by Government adverts saying the same thing. The muppets responsible for this state of affairs are taking the joy out of living. Here is a piece of very simple advice, if you are looking for cameras or electronic gadgets do NOT ever go into or buy from any camera shop that looks like the above on Nathan Road between the Peninsula Hotel and Yaumatei - these guys are world class scam artists. 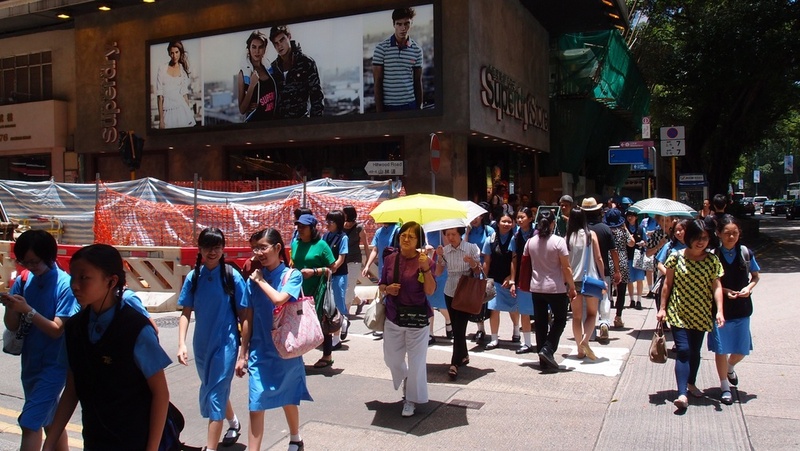 If you walk past the stores and look closely at the "sales assistants" they look thuggish and that it because a lot of them have connections to "organised crime" in Hong Kong, why would you deal with gangsters?? Still not convinced? then type nathan road camera shops into Google and check out the results. Stick to reliable retailers such as Fortress or Broadway. That little pod in the image is in fact an alien spacecraft, I spotted it in this restaurant supply store on Reclamation Street in Yaumatei in Kowloon... it looks like something from the Men in Black movie franchise.. appearances can be deceptive, it is capable of warp 6, has a crew of 75, has a compliment of 48 photon torpedo's and has cloak capability. That is a pregnant woman standing on the train, no one and I mean no one offered her a seat when she got on. This chap was not a happy camper. So, what's wrong with this image? The International School kids are 10 days into their summer holiday, the local kids are still at school. Bummer. I do love the stop motion setting on my camera, the Lambo does 0 - 60mph in like 4 seconds! Sorry for the funny angle, just me trying to be creative, a very impressive building overlooking Mirador Mansions and Nathan Road. Posted on July 9, 2013 by Jamie Lloyd.